The Becky Fund now has a page on Facebook. Go to Facebook to join. Thanks to Ann Woolf Smith for creating the page. Este año fuimos afortunados de tener 6 miembros de nuestro grupo que ni conocían a ninguno de nosotros ni sabían exactamente lo que iban a estar haciendo. Eran personas valientes y generosas que agregaron diversidad, entusiasmo y una gran energía a nuestro trabajo. Los dos doctores y la enfermera añadieron una dimensión médica. Viajaron por 3 días en colchones en la parte trasera de una ambulancia con un grupo médico local a unos pueblos retirados. La primera noche los colchones se convirtieron en sus camas, colocados lado a lado en el suelo de un edificio de la comunidad. Cuando se empezó a correr la voz que teníamos doctores, por las tardes la gente hacía cola en frente del portón. Con paciencia le dieron atención personal a cada persona que venía. Desafortunadamente, la mayoría de los tratamientos solicitados estaba un poco más allá de lo que se podía hacer en nuestra sala… ¡como tumores cerebrales! También quiero agradecerles a nuestros donantes de Nueva Zelanda con cuyas contribuciones se recuperó el déficit de fondos causado por la bajada de 25% del valor del dólar estadounidense. Gracias de nuevo de todos del Becky Fund por su apoyo continuo de nuestro proyecto. Como a lo mejor ya saben, ahora les dedico nuestro trabajo a ambos Becky y Michael. Nuestro viaje de 2009 será el 17 de abril al primero de mayo. Gracias a nuestra voluntaria fiel, Ann Smith, por armar la carta de 2008. Este año el grupo que se reunió en Perú para seguir con el trabajo del Becky Fund fue compuesto por Dinny, su hermana Christina y su cuñado Ross de Nueva Zelanda, Leonard Jiménez de Las Cruces, Nuevo México, viejos amigos Ann Smith (Massachusetts) y Melissa Cole (Texas), y nuevos amigos Arash Babaoff y Drew Schnitt, doctores con Operation Smile, Susan Hoelle, una enfermera de Cincinnati, Ohio, Safari McDoulett (Florida), Asha Vida (Michigan), y Lana Rahme (Michigan). Como siempre, teníamos mucho apoyo en Calca de la familia Wilson. Como en los años pasados, disfrutamos de una comida grande preparada cada día por la Señora Yolanda Wilson. Hernán Wilson nos acompañaba en nuestros viajes y mantenía archivos. Ligia y Carlos nos mostraba una calurosa hospitalidad en Cusco y Urubamba y nos facilitaban la adquisición de provisiones. La familia entera nos dio la bienvenida con los brazos abiertos, nos dieron de comer y nos entretuvieron. Estoy completamente de acuerdo con la evaluación de Drew acerca de las necesidades de atención médica que tienen los niños del Valle Sagrado. Viajamos a los pueblos más retirados y así tuvimos la oportunidad única de ayudar a la asistencia médica local. La pobreza y la desnutrición son la norma ahí, y hasta las contribuciones más pequeñas reciben una gratitud increíble y una serenata. La naturaleza bondadosa y sencilla de la gente te enternece. Los niños del Valle Sagrado, como todos los niños, siempre están listos para jugar contigo, y su alegría y entusiasmo te atraen. Estoy emocionado de echar a correr la voz acerca del Becky Fund. Los voluntarios reciben una perspectiva única e íntima del Valle Sagrado, su gente, su paisaje, sus necesidades. No creo que sea posible hacer una misión como ésta sin recordarla y compararla con futuros viajes. Siempre está presente en mi mente. El viaje fue maravilloso con toda la emoción de los niños y la diversión de conocer a nuevos amigos. Tuvimos noches de celebración, pero también unos momentos más sombríos cuando nos acordamos de Becky y de Michael. Todos nosotros admiramos mucho a Dinny por llevar sus espíritus con ella para darles a los niños del Valle Sagrado el regalo de aprender. Para concluir, el Becky Fund ha ayudado a más de 4.500 de alumnos este año con útiles escolares individuales y materiales para el salón de clase. Cada año se adapta el sistema para asegurar que los materiales lleguen a los niños que más los necesitan. Nada de esto sería posible sin su ayuda y apoyo. Gracias de todos nosotros. This year we were fortunate to have 6 new members of our group that didn’t know any of us, or exactly what they were going to be doing. They were brave and generous souls who brought diversity, enthusiasm and great energy to our work. The 2 doctors and the nurse added a new medical dimension. They traveled for 3 days with a local medical group on mattresses in the back of an ambulance to some remote villages. The first night the mattresses became their beds, laid side by side on the floor of a community building. As word spread that we had doctors people would line up outside our gate in the evenings. They patiently gave personal attention to every one who came. Unfortunately, most of the treatments requested were a bit beyond what they could take care of in our living room….like brain tumors! I also want to thank our New Zealand donors whose contributions made up the shortfall in funds caused by the 25% drop in the value of the dollar. Thank you again from everyone at the Becky Fund for your continued support of our project. As you probably know, I am now dedicating our work to both Becky and Michael. Thanks to loyal volunteer, Ann Smith, for putting together the 2008 letter. The group that gathered in Peru this year to carry out the Becky Fund work was comprised of Dinny, her sister Christina and brother-in-law Ross from New Zealand, Leonard Jimenez from Las Cruces, old friends Ann Smith (MA) and Melissa Cole (TX), and new friends Arash Babaoff and Drew Schnitt, doctors with Operation Smile, Susan Hoelle, a nurse from Cincinnati, Safari McDoulett (FL), Asha Vida (MI), and Lana Rahme (MI). We were well supported as usual by the Wilson family in Calca. As in years past, we enjoyed a large main meal cooked each day by Señora Yolanda Wilson. Hernan Wilson accompanied us in our travels and kept records. Ligia and Carlos showed us warm hospitality in Cusco and Urabamaba and facilitated our purchase of supplies. And the entire family welcomed us with open arms and fed us and entertained us. “I loved my experience in Peru. The family of Becky and the volunteers who were there are inspiring. It was like going to camp for adults! I still haven't come down from my camp high and I hope I never do! Coming home from this trip has rekindled my desire to seek out living a life with more meaning. Not only do they accomplish a lot for the kids, the group gave us the opportunity to glance through the eyes of others in an intimate way. It is inspiring the same way a smile creates a catchy energy in a room. I'm excited and thankful for a refreshed outlook on what is possible in the world through ordinary (and extraordinary) people. Be inspired and get involved! Thank you to everyone who supports making this possible. It was great working with you and I am really impressed with what you are doing there. The Becky Fund Mission 2008 was all that a volunteer could expect and more. The beauty of the Sacred Valley is an unbelievably beautiful backdrop for the task at hand. I have traveled the world doing humanitarian work and some of the poorest living and nutritional conditions I have seen are in the Sacred Valley. The basic needs of the indigenous people there are poorly met yet the people are incredibly friendly and gracious. The children are so overjoyed to receive much needed school supplies and the teachers may be even happier. Providing health care for the fist time on a Becky Fund Mission was also quite enlightening. There are many health care needs that could be better met in these remote regions with a little more effort and the nutritional and living conditions could be vastly improved with some minimal intervention while preserving the local atmosphere and culture." “While my initial focus on our drives high into the Andes lining the Sacred Valley of Peru was the myriad of children that the Becky Fund was to serve, it soon changed to the entire community supporting those children. My eyes couldn't help but be riveted on the brightly clad ninos looking like a flock of red cardinals flying to meet us. They were joyful and appreciative. But trailing behind them were always parents, teachers, and others within the community with offerings of handshakes, or sometimes potatoes. Their gratitude shone as brightly as their smiles. "I feel so fortunate to have happened upon the Becky Fund Mission this year. Yet it comes as no surprise to me, since I was quickly taken into the fold after being introduced to it by my friend, Melissa Cole, a veteran of this mission in past years, and my divining rod for important causes. I, in turn, had the good fortune to invite friends and loved ones to participate, and before you know it, we really had a remarkable group of people. I don’t think that I can agree enough with Drew’s assessment of the health care needs of the children of the Sacred Valley. We had the rare opportunity to join in with the local public health care effort, being transported out to the most remote villages. Poverty and nutritional deficiencies are the norm there, and even the smallest of contributions are met with incredible gratitude and serenading. The people touch you with their kind and unassuming nature. The children of the Sacred Valley, like all children, are always ready to play with you, and their joy and enthusiasm just draws you in. I really look forward to spreading the word about the Becky Fund. 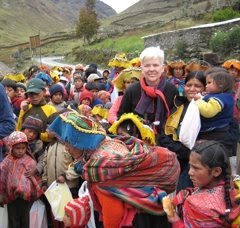 Volunteers get such a unique and intimate view of the Sacred Valley, its people, its landscape, its needs. I’m not sure that it’s possible to go on such a mission and not to think back to it or to compare it to future trips taken. It stays with me. My hat is off to Dinny and her crew. Her incredible dedication has created a model opportunity to touch both the people of the Sacred Valley as well as the volunteers who have the good fortune and initiative to join in." The trip was wonderful, with all of the excitement of the children and the fun getting to know new friends. We had evenings of celebration, but also some more somber times of remembering Becky and Michael. All of us greatly admire Dinny for carrying their spirits with her to give the gift of learning to the children of the Sacred Valley. In conclusion, the Becky Fund reached over 4500 students this year with individual and classroom supplies. Each year there is some adjustment to make sure that the supplies are going to the children who need them most. None of this would be possible without your help and support. Thank you from all of us. The 2008 trip to Peru went very well. We delivered supplies to over 4000 students. We will post a full trip description soon. It is with great sadness that I inform you of the accidental death of Becky's older brother, Michael on September 14, 2007. 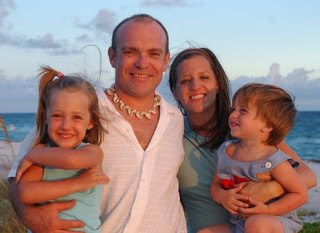 He leaves behind his wife, Christine, and his beloved children, Marley, age 6 and Avery, age 3. Aaron Ebner, who has done two summer projects for the Becky Fund, has graciously agreed to join the Becky Fund Board. Becky's brother, Alex, has taken over Michael's position of President and Aaron will be the new Vice President. Jessie Epstein, Becky's childhood friend, remains as Secretary and I stay on as Treasurer. Our annual trip is scheduled for April 11-25. I will continue our work in Peru in honor of both of my children, Becky and Michael.